Bristol-Myers Squibb licensed exclusive China rights to market Coniel, a calcium channel blocker treatment for hypertension and angina pectoris, from Kyowa Hakko Kirin Co. BMS said the transaction, its first China-specific in-licensing deal, demonstrated the company’s long-term commitment to China. Previously, Kyowa Hakko Kirin handled China marketing of the product itself. Benidipine (INN), also known as Benidipinum or benidipine hydrochloride, is a dihydropyridine calcium channel blocker for the treatment of high blood pressure (hypertension). Benidipine is dosed as 2–4 mg once daily. Benidipine is sold as Coniel by Kyowa Hakko Kogyo. Benidipine is only licensed for use in Japan and selected Southeast Asian countries, where it is sold as 4 mg tablets. Hi-Eisai Pharmaceutical, Inc. “Coniel (benidipine) package insert (Philippines)”.MIMS Philippines. CMPMedica. Retrieved 2008-03-31. Orally active antihypertensive agent which displays a wide range of activities in vitro and in vivo. Inhibits L-, N- and T-type Ca2+ channels. Also inhibits aldosterone-induced mineralocorticoid receptor activation. Exhibits cardioprotective and antiartherosclerotic effects. Yao et al (2006) Pharmacological, pharmacokinetic, and clinical properties of benidipine hydrochloride, a novel long-acting calcium channel blocker. J.Pharmacol.Sci. 100 243. PMID: 16565579. Kosaka et al (2010) The L-, N-, T-type triple calcium channel blocker benidipine acts as an antagonist of mineralocorticoid receptor, a member of nuclear receptor family. Eur.J.Pharmacol. 635 49. PMID: 20307534. Benidipine hydrochloride, whose chemical name is (±)-(R*)- 1 ,4-dihydro-2,6-dimethyl-4-(meta-nitrophenyl)-3 ,5-pyridinedica rbolate methyl ester [(R*)-l-benzyl-3-piperidine alcohol ester], belongs to dihydropyridine receptor antagonist. It can bind to dihydropyridine receptors at the binding site with high affinity and high specificity, and shows a strong inhibitory effect on Ca channel. Benidipine not only has an inhibitory effect on muscular (L-type) Ca channel, but also has an inhibitory effect on voltage-dependent N- and T-type Ca channels. It is, up to now, the only calcium antagonist that can inhibit all the three Ca channels mentioned above. Furthermore, benidipine has highly affinity with cell membrane, has vascular selectivity and renal protection effect. Therefore, it is an ideal, safe and effective agent for the treatment of hypertension and renal parenchymal hypertension and angina. There are two chiral atoms in the molecule of benidipine hydrochloride, which locate on site 4 of the dihydropyridine ring and site 3′ of the side chain piperidine ring. Accordingly, benidipine hydrochloride has 4 optical isomers: (S)-(S)-(+)-a, (R)-(R)-(-)-a, (R)-(S)-(+)^ and (S)-(R)-(-)^, and the active ingredients for drug are the mixture of (S)-(S)-(+)-a and (R)-(R)-(-)-0L Therefore, it is necessary to separate a and β isomers during the post- treatment stage of benidipine hydrochloride preparation. Based on the order of synthesis of dihydropyridine main ring, there mainly are two groups of total 5 synthesis routes of benidipine hydrochloride. Among them, there are two routes which involve synthesis of the main ring first: 1) acylchloridizing the main ring of dihydropyridine and then linking the side chain to synthesize directlybenidipine hydrochloride; 2) After acylchloridizing the main ring of dihydropyridine, 3-piperidinol and then benzyl is added. The routes involve the synthesis of the main ring later includes the following; 1) synthesizing the main ring via β-aminocrotonate; 2) synthesizing the main ring via acetylacetate ester; 3) the One-pot’ method involving 3-nitrobenzaldehyde, β-aminocrotonate and acetylaceate ester. 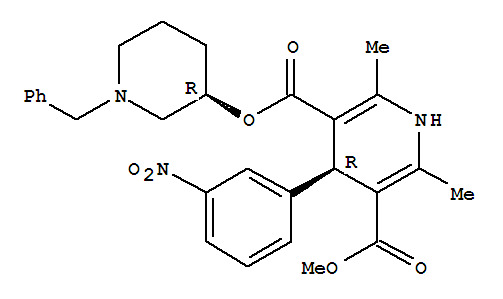 Several synthetic routes of benidipine hydrochloride and its analogues have been disclosed in EP0063365A1, EP0161877A2, JP57-171968A, EP0106275 A2, etc. Among them, EP0106275 A2 gave a summary of the synthetic pathways ofbenidipine hydrochloride. In all of the above references, it was mentioned to separate the benidipine hydrochloride prepared through column chromatography and spit it into its a and β isomers, thus obtain the therapeutically active (±)-a-benidipine hydrochloride. In order to obtain a highly purified benidipine hydrochloride meeting pharmaceutical use, it is necessary to perform multiple recrystallization with acetone and/or ethanol. Moreover, the crystallization condition is relatively strict since it should be performed below freezing point or even below -20 °C . Furthermore, the crystallization process usually need a relatively long time (more than 24 hours). JP2007-8819A thus disclosed a method for preparing highly purified benidipine hydrochloride meeting pharmaceutical use by first preparing the monohydrate of benidipine hydrochloride. Because benidipine hydrochloride has a very low solubility, for dissolving in a solvent quickly, benidipine hydrochloride is often grounded into nanoparticles. CN 1794993 A provided a method to grind benidipine hydrochloride into particles of 1.0^50.0 μπι. The mechanical grinding method is performed by grinding larger particles of crystals into desired smaller size of crystals. This method consumes large amount of energy and time, and results in a widely distribution of the crystal particle size. Chromatography column: stainless steel column: 4.6 mm x 10 cm, with octadecylsilyl (ODS) silica as filler. Mobile phase: mixed solution of 0.05 mol/L potassium dihydrophosphate solution (pH 3.0): methanol : tetrahydrofuran (65:27:8) Flow rate: adjusted to render the retention time of benidipine hydrochloride to be about 20 min. Literature References: Dihydropyridine calcium channel blocker. 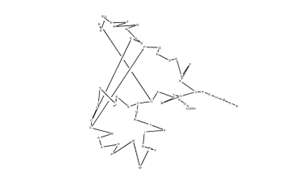 Prepn (stereochemistry unspecified): K. Muto et al., EP 63365;eidem, US 4448964 (1982, 1984 both to Kyowa). Prepn: eidem, EP 106275 (1984 to Kyowa); and toxicity data: eidem, Arzneim.-Forsch. 38, 1662 (1988). Structural studies: N. Hirayama, E. Shimizu, Acta Crystallogr. C47, 458 (1991). Series of articles on properties, pharmacology, determn and clinical evaluation: Arzneim.-Forsch. 38, 1666-1763 (1988). Review: H. Suzuki, T. Saruta,Cardiovasc. Drug Rev. 7, 25-38 (1989). Properties: Yellow crystalline powder, mp 199.4-200.4°. uv max (ethanol): 238, 359 nm (e 2.80 ´ 104, 6.68 ´ 103). Soly at 25° (%): methanol 6.9; ethanol 2.2; water 0.19; chloroform 0.16; acetone 0.13; ethyl acetate 0.0056; toluene 0.0019; n-heptane 0.00009. pKa 7.34. Partition coefficient (n-octanol/water): 1230 (pH 6.4, 22°). LD50 orally in male mice: 218 mg/kg (Muto, 1988). In the global market, the position of the pharmaceutical industry is not parallel as compared to other information and technology based industries. comparison with the growth rate of the electronic and IT industry stands first where as the pharmaceutical comes at the 9th position. Ecallantide It is an inhibitor of the protein kallikrein and a 60-amino acid polypeptide. KALBITOR (ecallantide) is a human plasma kallikrein inhibitor for injection for subcutaneous use. Dyax Corp. a developer of novel biotherapeutics for unmet medical needs, and CVie Therapeutics (CVie), a subsidiary of Lee’s Pharmaceutical Holdings Ltd., announced today a strategic partnership for the development and commercialization of KALBITOR® (ecallantide) in the treatment of hereditary angioedema (HAE) and other angioedema indications in China, Hong Kong and Macau. If approved in China, KALBITOR would become the first novel therapy available for HAE in China, where presently only steroids are used. KALBITOR (ecallantide injection) is a clear and colorless, sterile, and nonpyrogenic solution. Each vial contains 10 mg ecallantide as the active ingredient, and the following inactive ingredients: 0.76 mg disodium hydrogen orthophosphate (dihydrate), 0.2 mg monopotassium phosphate, 0.2 mg potassium chloride, and 8 mg sodium chloride in water for injection, USP. KALBITOR (ecallantide injection) is preservative free, with a pH of approximately 7.0. A 30 mg dose is supplied as 3 vials each containing 1 mL of 10 mg/mL KALBITOR (ecallantide injection) . Each vial contains a slight overfill. Vials are intended for single use. Ecallantide is a 60-amino-acid protein produced in Pichia pastoris yeast cells by recombinant DNA technology. The Ecallantide, with the IUPAC name of [Glu20,Ala21,Arg36,Ala38,His39,Pro40,Trp42]tissue factor pathway inhibitor (human)-(20-79)-peptide (modified on reactive bond region Kunitz inhibitor 1 domain containing fragment), is one kind of inhibitor. This chemical’s classification codes are Plasma Kallikrein Inhibitor; Reduction of Blood Loss During Cardiothoracic Surgery (Plasma Kallikrein Inhibitor); Treatment of Hereditary Angioedema. Ecallantide (trade name Kalbitor, investigational name DX-88) is an inhibitor of the protein kallikrein used for hereditary angioedema (HAE) and in the prevention of blood loss in cardiothoracic surgery. If approved for cardiothoracic surgery, it could become a replacement for aprotinin, which was withdrawn in 2007 after being shown to cause complications. Ecallantide (trade name Kalbitor, investigational name DX-88) is a drug used for the treatment of hereditary angioedema (HAE) and in the prevention of blood loss incardiothoracic surgery. It is an inhibitor of the protein kallikrein and a 60-amino acidpolypeptide which was developed from a Kunitz domain through phage display to mimic antibodies inhibiting kallikrein. On November 27, 2009, ecallantide was approved by theU.S. Food and Drug Administration for the treatment of acute attacks of hereditary angioedema for persons over 16 years of age. If approved for cardiothoracic surgery, it could become a replacement foraprotinin, which was withdrawn in 2007 after being shown to cause complications. Lehmann A (August 2008). “Ecallantide (DX-88), a plasma kallikrein inhibitor for the treatment of hereditary angioedema and the prevention of blood loss in on-pump cardiothoracic surgery”. Expert Opin Biol Ther 8 (8): 1187–99. doi:10.1517/14712598.8.8.1187.PMID 18613770. Waknine, Yael (December 4, 2009). “FDA Approves Ecallantide for Hereditary Angioedema”. Medscape. Retrieved 2009-12-07. Dyax Corp. (2009). “Full prescibing information Kalbitor”. Retrieved 2010-05-02. Stefan Offermanns; Walter Rosenthal (2008). Encyclopedia of Molecular Pharmacology. Springer. pp. 673–. ISBN 978-3-540-38916-3. Retrieved 11 December 2010.